My surgery was virtually pain free thanks to great staff in the recovery room and a scrip for oxycodone. I did ask for a pain block in the surgery area so that my 4 hour trip home would be more easy to handle, which was agreed to by the anesthesiologist and Dr. Gill. I was also given a good pain killer since I explained that regular codeine was like an aspirin for me. The staff and Dr. Gill were great, could not have had a better experience in this kind of situation. My trip home was in the back seat, 4 hours. I made it fine with the pain killers. At day four, no more pain killers. I was extremely surprised at how easy the surgery went. Post op pain was just no problem at all. I have had several surgeries for other reasons in the past and post op pain was extreme, so I am not unfamiliar with dealing with post op pain. I have to say that I was very surprised. I was quite terrified of getting my tailbone cut out, especially after reading what others said, even the 'good' stories of this procedure. And after seeing the post op photos of the wounds, I almost backed out of this surgery. But I love to ride horses and this broken tailbone pain was keeping me from doing what I enjoy most without lots of pain. My doctor was Dr. Kevin Gill of Dallas, Texas [but see note below]. My cowgirl hat is off to Dr. Gill. I went to him first for this problem, not even bothering with any local MDs or family docs. After researching, and the best info was on your site, I made my decision and prayed it was the right one. Now I know it was. I can even sit down as I type this email, yes, carefully, but I am sitting, with no cushion. I know it will be several weeks before I can attempt to get back in the saddle, but I have the utmost confidence that I will. I highly recommend Dr. Gill. He tried to reassure me that my fears were more than they should be about post op pain, but I honestly did not believe him. That is kind of hard for anyone to believe considering what is getting cut out of you. I would highly recommend Dr. Gill to anyone, anywhere in the US, or out of the US. If you have to fly, it is worth the ticket! 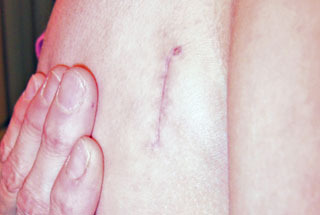 My incision is barely 2 inches long, if that. And the cut is off center, slightly on the left cheek, so as to avoid the more thin skin right over the tailbone, helping to avoid tearing stitches back open. I am able to sleep lying on my back too, have been since the day I came home. Like I said, it has only been 9 days since my surgery. I walked one mile on my treadmill today, trying to get my strength built back up and hopefully speed up the recovery time. To give reference idea as to the size of my cut, I am 5'9" and 150 lbs, wear a size 9 jeans. I am five weeks post op today. By 3 weeks post, I was feeling like my old self, not in any pain. I was being careful not to pick up anything heavy and walking 2 miles a day on my treadmill. I have to say once again, the skill of the surgeon is what I feel has made my surgery such a success. I have a tiny 1 1/2 inch cut in my left upper/inner cheek. That is it. My recovery was cinch. I did not need a pain pump, went home the same day. I had virtually no bruising. I have not had any of the old pain at all. I began being able to sit after week 2 (carefully). Now I can sit anywhere, however long I want. I drove 4 hours this past weekend on a trip and was a little stiff when reaching my destination, but that soon went away when I got out and walked around. I have just rode my horse, which was the main drive to get me to have the surgery. I had no pain what so ever. I have my life back! I just cannot emphasize enough, the skill of my surgeon. If your doctors say don't get this done, I would recommend you go see Dr. Kevin Gill in Dallas Texas. Even if you have to fly, it will be well worth the ticket.